According to archaeologists, the oldest mask in the world was discovered on an African wall painting that dates to approximately 4,000 B.C. Masks, in other words, have been with humans since the beginning of civilization, often being used in religious rites and ceremonies, as talismanic idols that contain the spirit of a god. Masks have also played a central role in Japanese noh theater, ever since the medium’s birth in the 14th century. 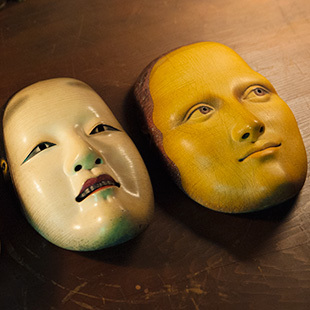 In both the music and dance pieces and the theatrical performances that make up the plot of noh plays, noh masks (nōmen) have played a central role from the beginning, and are connected with the appearance of the gods on stage. Most plotlines are adapted from Japanese myths and folk legends, and when kami (gods) appear on stage, the performers who play them put on masks to signify that they are no longer human. These masked performances, which convey the kami’s presence via thick, wooden masks frozen into a single expression, are necessarily highly symbolic, and call on the audience’s imagination to interpret them. As a result, noh masks have taken on wildly diverse meanings, both in the noh repertoire and in Japanese culture at large. 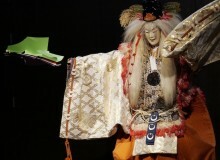 Bidou Yamaguchi is a theater craftsman who has spent his career creating noh masks. Since 2014, his works have been on a touring exhibition in museums in such major American cities as Houston, Chicago, and Los Angeles. But why have his masks drawn such praise and interest in the U.S.A.? 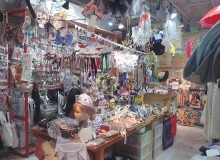 When Yamaguchi began making masks in 1992, he worked mostly on traditional noh masks. Today, a mask maker’s work mainly involves restoring original masks to working condition or making duplicates of those traditional masks. Yamaguchi, however, quickly realized that working within those limits meant he would never overcome the medieval originals, and he began to seek out new possibilities for mask making. The result of his search appeared in 2003, when he reimagined Leonardo da Vinci’s Mona Lisa (ca. 1503-06), expanding the two-dimensional painting into 3D relief as a noh mask. The choice, in retrospect, makes sense: if you compare the Mona Lisa with an onnamen—one of the representative female masks of the noh repertoire—you’ll quickly notice how alike they are. The Mona Lisa is valued, more than anything else, because of the eternal riddles posed by its model’s unreadable expression. Coincidentally, the onnamen came into the world at more or less the same time as Da Vinci’s painting (it is typically dated to the late 15th century), and it exhibits more or less the same gaze. After he’d chosen the subject for his new mask, Yamaguchi gradually came to notice this similarity. After Mona Lisa, Yamaguchi started creating a series of masks based on masterpieces of Western art, including Vermeer’s Girl with a Pearl Earring (1665) and Boticelli’s Birth of Venus (1486). These works quickly caught the eye of American art connoisseurs. 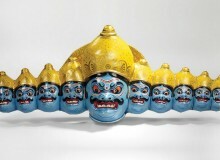 In 2011, after finishing the series on Western paintings, Yamaguchi shifted focus and began making masks based on the work of Tōshūsai Sharaku, a famous ukiyo-e artist from the 18th century. In his adaptations of the Mona Lisa and Girl with a Pearl Earring, Yamaguchi tried to capture the light in the paintings by showing the women’s faces in full three-dimensionality; but because ukiyo-e does not employ linear perspective, when compared to Western oil paintings it looks very flat. Turning a 2D painting into a 3D mask might seem difficult, but when he began working from ukiyo-e, which lacks any sense of volume at all, the task began to feel even more difficult. Thanks, however, to the skill, experience, and imagination he had cultivated through his earlier work, Yamaguchi found success quickly. Today, Yamaguchi has expanded his original training into an oeuvre that creates masks from Western masterpieces and the ukiyo-e of Sharaku. But from the mask maker’s craft of duplicating originals, to the new challenge of making masks out of a Western painting, he insists the question is the same: how do you create a reproduction of an earlier work? 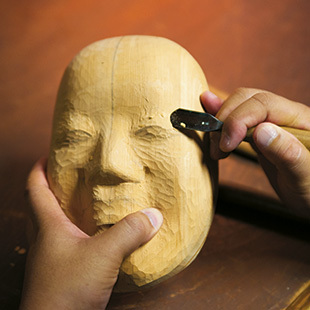 The essential techniques of creating noh masks—of carving features into Japanese cypress, of coloring the surface, and of applying lacquer—helped Yamaguchi recreate the cracks in the aging paint of the Mona Lisa, as well as the mold spots and stains on the Japanese paper used for Sharaku’s prints. Works like the Mona Lisa and Girl with a Pearl Earring, both of which have survived for centuries, give their viewers a sense of a world very different from the reality they know. Linking the yūgen of this art world with the yūgen of noh, which has existed since the 14th century, has become the core of Yamaguchi’s own art. 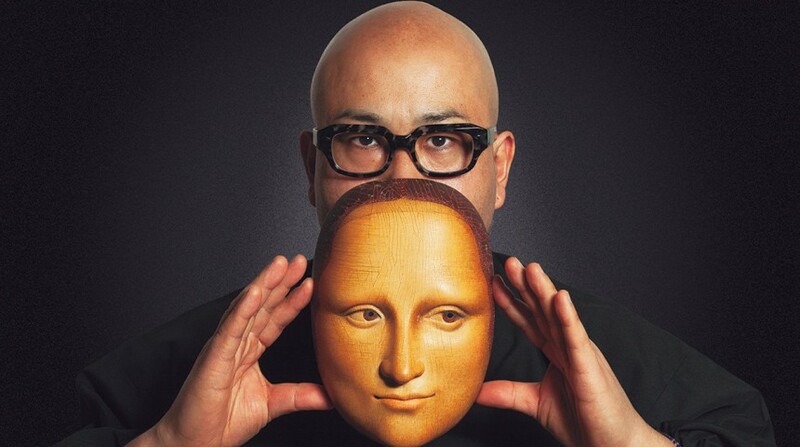 Through Yamaguchi’s work, a new, contemporary stage has been created that demands new, contemporary masks, just as noh’s original masks were born from the medium’s roots as an avant-garde art form of the 14th century. 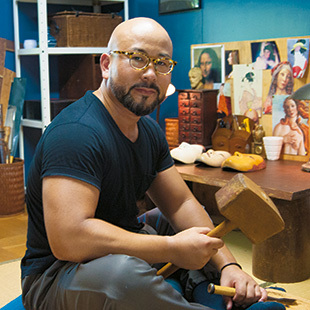 Today, Yamaguchi’s exhibition continues its tour of the United States, including a stop at the Anthropology Museum at California State University, Sacramento, where it will play a part in the school’s Festival of the Arts 2016 running from April 13 to 16. This story originally published on IGNITION. Visit http://ignition.co for more features on Japanese culture.